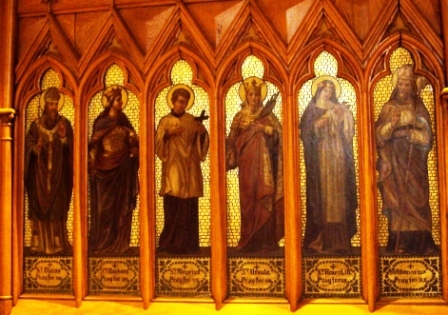 Prayer to the saints is not worship of them. We pray with saints, not to them. People often ask others to pray for them. Since saints are close to God in heaven, we ask them to speak to God on our behalf. Their prayers are powerful before God. Good St. Dymphna, you placed all your hope in Christ's promises, and sacrificed even your life in that hope. The Lord, God, rewarded your constancy by making your name known and loved over many centuries by the thousands whom you have aided in time of difficulty. Please assist us now in our present necessity, and intercede before God for our intentions. Obtain for us a firm hope like your own in God's unfailing protection. Amen. St. Jude, glorious Apostle, faithful servant and friend of Jesus, the name of the traitor has caused you to be forgotten by many, but the true Church invokes you universally as the Patron of things despaired of; pray for me, that finally I may receive the consolations and the succor of Heaven in all my necessities, tribulations, and sufferings, particularly (here make your request), and that I may bless God with the Elect throughout Eternity. Amen. There are more prayers to Saint Jude here. Dear St. Anthony, comforting the sorrowful is a Christian duty and a work of mercy. By word, attitude, and deed I should try to brighten their days and make their burden easier to bear. St. Anthony, Consoler of the Afflicted, may I remember when helping someone in sorrow that I am helping Christ Himself. Kindly mention my pressing needs to Him. (Name your special intentions).